Formulated to stop nails from breaking, peeling & chipping by promoting growth. You will have longer and healthier nails within 5 days. For brittle nails that just refuse to grow and promote results. The problem is that nails that won't grow because they are worn down as a result of work or just everyday tasks. 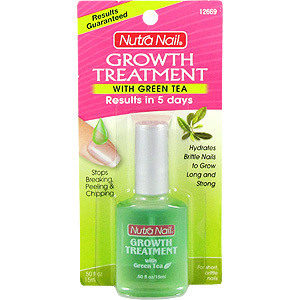 The solution to this is the Nutra Nail Growth Treatment with Green Tea. You have it massaged so that your nails receive the hydration that it truly deserve to restore flexibility by relieving it of the impurities that make it brittle. In then end you have nails that are longer than ever with a healthier look that provides great resistance to any roughness that your nails will naturally endure. Problem: Nails that are brittle and won't grow because they break, peel or chip easily. 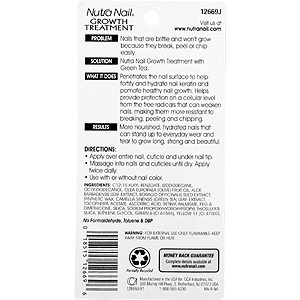 What it Does: Penetrates the nail surface to help fortify and hydrate nail keratin and promote healthy nail growth. Helps provide protection on a cellular level from the free radicals that can weaken nails, making them more resistant to breaking, peeling and chipping. 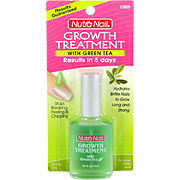 Results: More nourished, hydrated nails that can stand up to everyday wear and tear to grow long, strong and beautiful. Apply over entire nail, cuticle and under nail tip. Massage into nails and cuticles until dry. Apply twice daily. Use with or without nail color. Warning: For External Use Only. Flammable-Keep away from flame or heat. ISODODECANE, C13-14 ISOPARAFFIN, HYDROGENATED POLYDECENE, CYCLOMETHICONE, DIMETHICONE CROSSPOLYMER-3, DIISOPROPYL ADIPATE, TOCOPHERYL ACETATE, RETINYL PALMITATE, OCTYLDODECANOL, CAMELLIA SINENSIS (GREEN TEA) LEAF EXTRACT, TETRAHEXYLDECYL ASCORBATE, D&C GREEN #6 (CI 61565), D&C YELLOW #11 (CI 47000). That's all I need to say about the product. I use this about 1-2 times a day on my nails all day, since it makes them nice and strong. I'll continue to use this product as my nails have been so fragile in the past, now that isn't an issue anymore. I can apply nail polish without having to worry how I go about the day with my nails. Shana "You have to wait"
I know I shouldn't epect results overnight, but I used this product for 2-3 weeks before seeing any results and they were alright at best. I guess I'm not a patient person, but this was cheap so at least it didn't come at a huge loss. I have been using this product for several months and I can literally feel the strength in my nails. I'm somewhat surprised that this worked since I'm skeptical of these type products that take so long to produce any results. I was in luck this time, thankfully. My nails would peel so easily that it's embarassing. I needed to find something to strengthen it up and I came upon this product, gave it a shot. It's not eactly that clear type of polish so you have to let it dry in your hands a bit, so don't go running around. Slow and steady wins the race. I recommend this to anyone that jus wanted to add a little special something to their nails. Remember it takes time, but it works. cindybean "nails look very rich and full of life"
i do a lot of housework so my nails have deteiorated overtime. They became flaky and icky, sometimes they would chip away without effort. i started to use these and my nails aren't chipping and look very shiny, they even feel healthy too. my only issue is that you have to leave your hands for a few minutes so that it could dry, which is an small inconvenience that i dont mind dealing with compared to the results that i get out of this.